This is not a collection of previous bootlegs, this is a new collection. The Blade Runner soundtrack has a history as long and complicated as the film's own. Both have faced legal and distribution issues. Both have had troubled releases and multiple incarnations. Both have die-hard fans that have waited over the years (patiently, or not so patiently) for more, never released material. With the film, after 25 years, fan desires have been fulfilled beyond expectation. Ridley Scott has tinkered one last time with the material, releasing a "final cut" of the film. along with all previous versions, a new highly detailed 3 hour documentary featuring all the cast and crew (including Harrison Ford, a first since he never talks about the film), other docs and tidbits as well as never before seen and newly discovered deleted scenes. Indeed hell has appeared to have frozen over with Blade Runner fans receiving all they could have hoped for, the book on Blade Runner the film would appear to be closed. But a release of a definitive and comprehensive collection is where the film and the soundtrack differ. SOURCES: Official, and unofficial (bootlegs and such), as well as some sources of my own. WHAT IT HAS: The most complete collection of tracks related to Blade Runner ever offered. Completely restored, reproduced, rearranged, edited, remixed, and reengineered for the best possible listening experience. WHAT IT DOESN'T HAVE: Music with dialog and sound effects from the film. You won't hear spinners flying by (not that I don't love them). TYPE OF RELEASE: MP3 with the first preview (beta release). Eventually Lossless. WHEN IT WILL BE RELEASED: Early in the 21st Century. Otherwise, it's done when it's done. This project has earned the name "Blade Runner: The Complete Collection". The goal is to release the most complete collection of the music as is possible, no more, no less. Note: Should any new material surface after this project's release, it will be updated and re-released. The music of Blade Runner does not belong to a "Blade Runner music group" , or groups, or Vagnelis group, or groups, or anyone that considers themselves an elite fan. This music belongs to ALL Blade Runner and Vangelis fans. For ALL fans to enjoy, reflect on, and even perhaps be inspired by. This music does not belong to the smoky back rooms of over-priced rip-off bootlegs, or even to elite and exclusive chat rooms, music groups, and fan clubs. Or myself. In the end, this is the music of Vangelis. It is only my wish to present his music as best as I possibly can, my sole intention to preserve and amplify that which he has created. I do so with great love and respect for the composer and his work. Tracklist will change until complete. 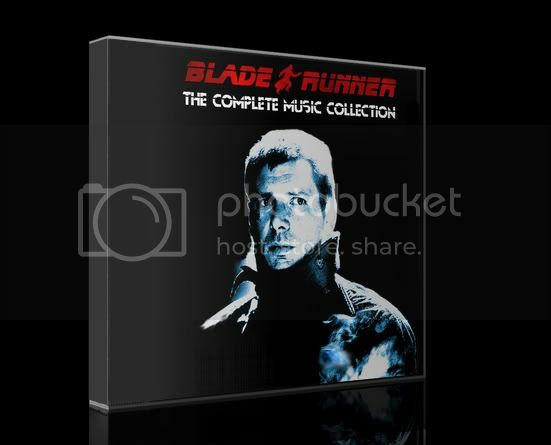 This collection should only be owned by people that own the official Blade Runner Soundtrack. Vangelis has a lot great work and you should get as much of it as you can. This collection is for research purposes only and is NOT FOR SALE. Are you using only lossless audio sources for the compilation? Thanks. Yes, that being said, the quality is only as good as the source. But for the most part, the sources are very good. There are of course lots of different sources, both official and unofficial, some of which I'm sure you can guess. There are some cases of over modulation and things like that but again, in these cases the sound is only as good as the source. That doesn't mean the quality won't be the highest possible. I should also perhaps point out that as well as remixing and re-engineering the sound, a lot of the sources have different speeds, some slight, some dramatic. This is mostly because a lot of the music that has leaked over the years was sourced from tracks after they were speed changed (not always the same speed) for the film. So you care to enlighten us on what exactly your sources are? and if it is sourced from all of these,what is going to be different with your set as opposed to having all of these? I will get into greater detail later but yes those are some of the sources I have used. After all the many bootlegs, and even the new 3 disc soundtrack, there is no true complete soundtrack to Blade Runner. This will be that. This is the one that replaces all the others. By complete collection i don't mean a collection of say all the bootlegs and official discs. This will be a new set that has everything within reason. What it won't have, for example, is tracks with sound effects. I've been able to avoid this so far. But it won't just simply be a collection of tracks. Like I said earlier almost all of the track leaked over the years has been speed changed or edited in some way, not to mention bootleggers creating their own mix. The sound has been remixed and redesigned. For the first time the music will sound the way it is supposed to sound. You have our attention and this sounds neat,so when is it going to be ready? when will you post your top secret specs? and how will it be obtained? I don't want to jinx myself but very soon. I want to get everything in place. I'm also doing cover art, and if I have time, Linear notes. As far as how to get it I'm open to ideas no where to host it. do you know how to torrent? if so you could go to the Pirate Bay. how big is the files going to be? piratebay? I don't know, maybe. I don't know I haven't decided bitrate yet. I get what your doing, impressive. really looking forward to it. just wondering why you faded the last note off of Tales of the future though? is it because the one on the 25th has a wind sound effect fading in at that point? In most cases, I'm using multiple sources for each track. Whatever I don't use, I compare for reference. In the case of Tales Of The Future, it was mixed using 12 tracks I created from various sound elements. An official source makes up only one of the elements. If you know the track well you'll notice added voice and syth elements in parts from outtakes. The source I used in the last section ended in an abrupt fade, so I reworked the fade myself to smooth the track. There are a lot of examples within the material I'm using where elements either fade or cut off suddenly. Unlike other collections, I'm not going to combine tracks just for the sake of it. Sounds or elements will only be combined if intended by the artist. Like in the case of Main Titles and Prologue. I posted a third track, I may put up another today. I do have a quick question. Does anyone have any hi-res photos or scans that I might want to use for the booklet art? Cheers! Mr. Puller, have you heard this one? Almost related to your project, I suppose. There may be some hi-res scans located in the albums available on this blog. Mods, if that link's a problem feel free to remove it. While the album of music preformed by The New American Orchestra is an interesting curiosity, it will not be featured in this collection. It will only feature music by Vangelis as well as other artists that were used in the film. Also, in my opinion, The New American Orchestra album is to Blade Runner what The Star Wars Christmas Special is to Star Wars. That being said it's still interesting, and thank you for the link and post. Two new tracks added for preview. How many previews are we gonna get before the real deal? I hate teasers,lets get the whole enchilada. How about I put up of all the tracks except one and save that for the release? that is what I thought you were doing,am I wrong,you kept saying "soon"
or is this on the same release schedule as the X0 project? I was making a joke. I put up the tracks so people have an idea of what I am doing and I have been getting a good response so far. Very soon means just that. I'm not giving a release date. I would love to say next week but if I can't finsihed it in time for whatever reason, then what? But as I said I'm finishing up the project, going over the tracks and I still have a cover to do and I'm hoping to put together a booklet. I'm doing all this for myself yes, but also as a fan for the fans. All I ask for is your support, let me know you like what I'm doing, and for you to enjoy the collection when it's released. This is a preview of the cover. I did several designs but this is the one I liked the most. The image is not shown at full quality but you get the idea. On a side note, the background is not grey it's black. It's simply how the 3d templete makes the image appear. You should put the shot of Harrison playing his piano on the back cover with text over it. Definitely looking forward to this. I have pretty much all the different versions floating around, but it'll be awse to be able to just play the one "the way it is in the film" collection. Cheers! You know what? That's a damn good idea. I wasn't sure what I was going to do for the back yet. I've got to find a nice high res of that, or otherwise just make a screen capture myself. New to this thread ... I'll be interested in the final product. I did a simple edit to the Esper edition with some of the new soundtrack elements ... got the spinner-less Main title mixed in, Dr. Tyrell's Owl, and Twinkling Space IIRC. That's about it, though. This sounds more comprehensive. I can't be the only person that was a bit disappointed in the new "25th Anniversary" edition. The new music was kinda cool for what it was, but I really wanted a "complete, chronological score" of Blade Runner. Vangelis, if I wanted FX and dialogue I'd just rip the DVD. I am fluent in over six million forms of procrastination.